The Aspen is my favorite tree. Surrounded by a national forest of pines and cottonwoods, the previous homeowners of our 129 acres had planted a lone Aspen outside the guest room. 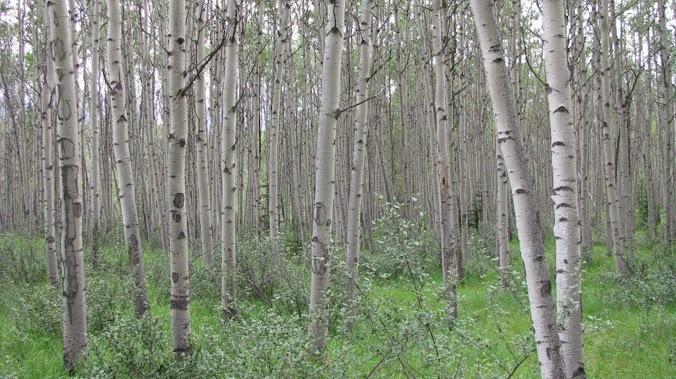 Aspens grow from the parent root stems, and the roots interlock deep below the surface. As the years pass, we will have a small family of Aspens to shade the east side of the house. The lifespan of an Aspen tree is only 80-120 years; mostly averaging eighty-five years. In the language of flowers, the Aspen tree signifies lamentation; sighing. The rustling of our young tree's leaves sounds like sighing, sometimes moaning, as though it misses its family. It's a poignant sound that makes me pause and pray for my family members. My friend Betty J. Slade from Pagosa Springs painted a series of Aspens called “The Message Trees.” While I prefer realistic renditions, the blue-tree version appeals to me. 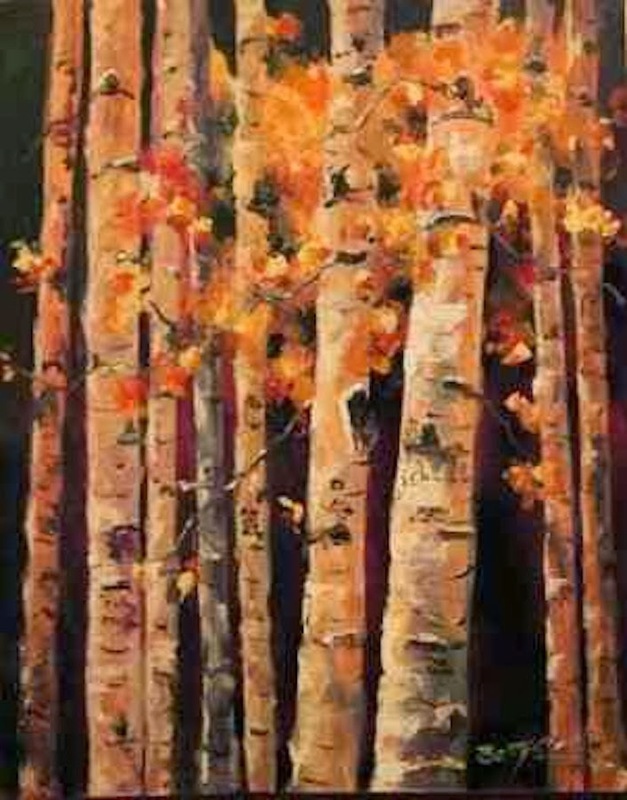 Betty said that Aspens were used as message trees by early sheepherders. These scribes of the forest were intriguing and presented an idea that had to be investigated. From the mid-eighteenth century until after World War II, thousands of young Basques came to the American West to tend the vast flocks of sheep that roamed the mountains and meadows of the region. Isolated in remote areas and frequently arriving and departing without ever appearing on official records, they left their mark on the western economy and the western forests. For more than twelve years, Dr. Joxe Mallea-Olaetxe, Basque History Instructor at the University of Nevada, Reno, has documented more than 20,000 tree carvings and studied them as valuable records of the Basque presence in the American West. The Basque immigrants from the Pyrenees Mountains between France and Spain came to the U.S. between 1860 and 1930. They supplied mutton to the early Western mining camps. According to Dr. Mallea-Olaetxe, “It can be said that the Basque sheepherders contributed more to the practice of tree carving than any other group in the western United States. Indians, trappers, early explorers, scouts, and prospectors spent considerable time alone in the wilderness but did not record their names and movements on trees or rocks like the Basques did.” Dr. Mallea-Olaetxe’s book, Speaking through the Aspens is dedicated to this phenomenal art form and historic mountain culture. Arborglyphs include Spanish, Basque, or French words or place names, or imperfect English usage or misspellings. The scribes used fine penny nails or knife blades to carve their messages. The trees would heal with a blackish scar wherever it was cut. Some messages were found dating prior to the historic Spanish Land Grants. There is a difference between the Basque carvings and the Hispanic carvings. Often it was a different type of lettering style, from an flourished cursive to stippling and relief lettering. The Basque/Hispanic carvings were delicate gray etchings that are still easy to read. Non-Basque/non-Hispanic carvings were distinct because of their heavy, thick, and boxy lines and letters. Over the years, these carving often blurred into an unreadable blackened scar. The earliest 1832 Mexican land grant, Tierra Amarilla Land Grant, is within the boundaries of present day Colorado and includes Navajo Lake. Descendants of the these pioneering Hispanic settlers are responsible for the vast majority of carvings in southern Colorado and northern New Mexico. Peggy Bergon, a member of the Pagosa Springs Historic Preservation Board, studies and documents the arborglyphs in Pagosa Country left by early Archuleta County sheepherders. She has photographed more than 5,000 arborglyphs to document the carvings on the trees and preserve a piece of Pagosa Country history. 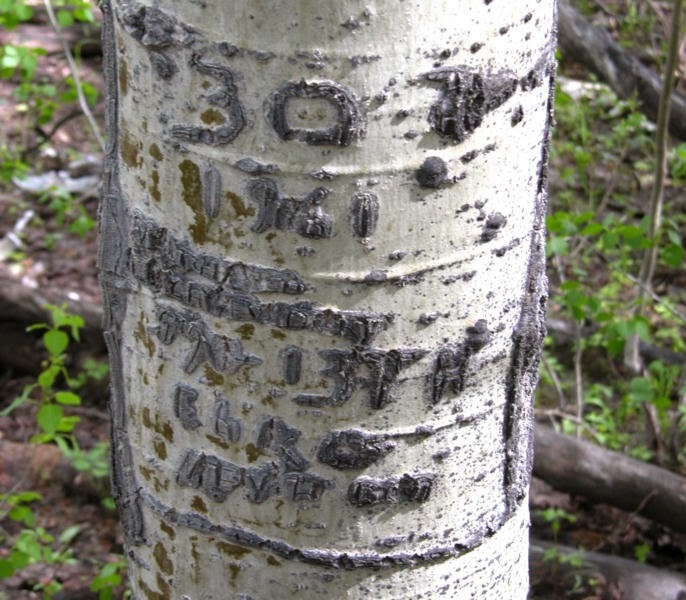 Hispanic sheepherders documented their presence on Aspen trees through the use of Arborglyphs, otherwise known as “tree writing.” Tree bark is carved with exquisite cursive writing, pictures, and dates that go back to the early years of the 20th century. When a shepherd wasn’t protecting the animals from death, injury, or disease, he would spend a lot of time wandering through the forest. Bergon believes that the shepherd found the clean, white bark of the aspen tree a perfect slate on which to give permanence to his thoughts and make each tree a living history. 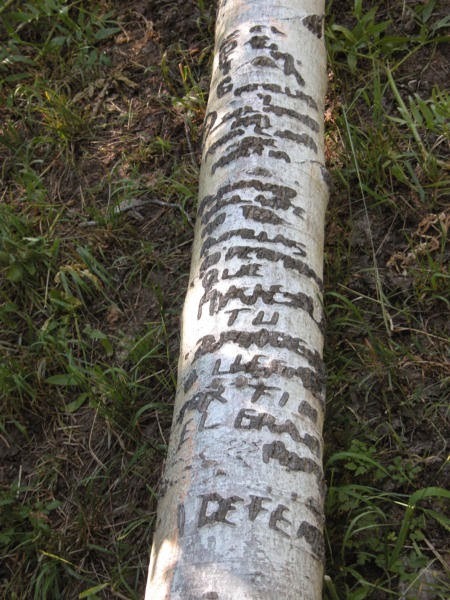 Arborglyphs researchers are able to identify people by the way they wrote their names on trees. Primarily, the pictures carved into the trees induce visions of home and family. We often see hearts and initials of lovers carved into tree, but seldom a glimpse into history. Santa Fe National Forest, Río Arriba County, New Mexico. Some of the surnames documented are prominent names in the Pagosa Springs community. 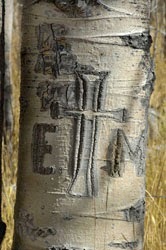 Photographs of those tree markings have been given to living family members. Over time, the arborglyphs are disappearing. It’s estimated that 75-90 percent of the arborglyphs are gone. Carvings are lost because of fungus, insects, disease, death or fires. Some trees have fallen and others have been hauled off for firewood. The USDA Forest Service ran a project in 1997 to record and study arborglyphs in the Fremont National Forest of Oregon. Researchers in Boise, Idaho are documenting their area arborglyphs. Aspen trees in the mountains and hillsides of Northern Nevada show the passing of the Basque sheepherders since the late 1800s. Jerry and I enjoy horseback riding and hiking. This year we hope to be two of the twelve hikers in September taking the Pagosa Springs "Walk Through the Aspen Groves" at Buckles Lake Trailhead. You can't see and absorb these wonderful trees in only one trip. 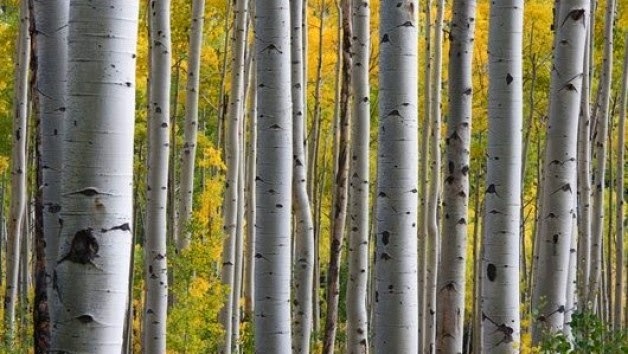 If you were a sheepherder far from home in a foreign land, without family and friends, what long-lasting message would you gently carve into the bark of the elegant Aspen? Blessings and looking forward to seeing you on February 27th. My Southwestern Indian Detour Couriers series Voices in the Desert spans the years 1928-1932 in New Mexico and Arizona. Book one Treasures Among the Ruins is set in 1926 northwest New Mexico and features Cornelia Miller who is searching for self-identity and finds that love is as sure as the spring grass under the winter snowflakes. Linda, what a fascinating post. I love aspens, too, but never knew about arborglyphs. What message would I carve? That''s something to think about, isn't it? I would have written my name and the names of loved ones. I might have even carved out an idea for a novel. LOL. Thanks, Margaret. Until we moved to Colorado, I was unaware of them as well. To touch a living tree that bears the mark of history is awesome. I'm not sure what I would carve either. Family names and birth dates and where they lived, if they were still in a far away place. Carving on trees is not a feature of any historical romance I've read. I'm going to keep my eyes open for one - - a future one of yours maybe!! What would I carve? Hmmm. I'd like to think I'd carve something giving praise to the Lord or telling others about Him, but knowing me, it would be something far less important. LOL Thanks for the wonderfully interesting post, Linda! Hi Jennifer, thanks for the shout-out on Facebook. I appreciate it. The more I think about it, after I answered Margaret, I'm wondering if I could carve on a living tree. I'm glad you enjoyed the post. I had never heard of the message trees (aspens). So interesting. I would think birch trees would work for this also. Hey Sharon, good to see you again. I agree that the Birch would be a good choice. I know that in the 14th century the Russians used the bark to write letters on. I wonder how the bark would scar. Out here we see more River/Water Birch and the Paper Birch, smaller broadleaf trees than the typical birches. Hi Kathleen, it's good to see you again. Our singular planted tree now has three saplings. It's interesting how they grow naturally in a ring. Down the road, west toward Durango, is a meadow with a massive grove of Aspens. I met the owners a few weeks ago, but didn't make the connection when she told me where she lived, so I didn't get to ask if they had any message trees in that grove. That's on my list to do come spring. I have no idea what I would carve! My name and birthday, maybe? Or I <3 (the name of my fella if I had one? 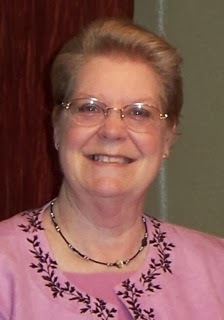 This post is so neat, Linda! 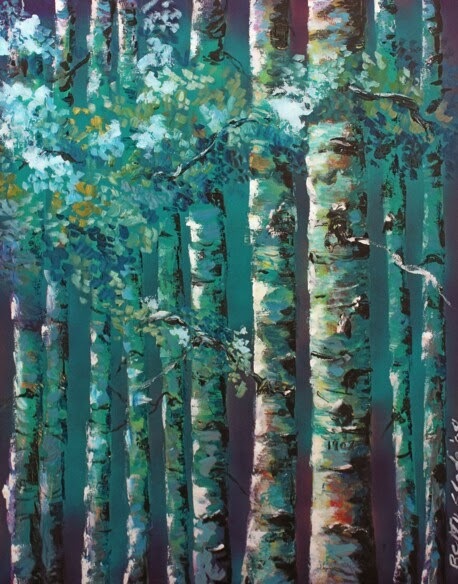 I would love to go on the Walk through the Aspen Groves! How beautiful and interesting that would be! On a different note, I was on your website looking for your contact info but couldn't find an email or anything so I've been waiting for this post this month! I think there's a chance we could be related on the Farmer side! Please email me if you want: kam110476 (at) gmail (dot) com. Have a beautiful day! Hi Kristen, come on down to Colorado. The Aspens are beautiful. Let's compare Farmer notes. Hey, my brother, so good to see you peeking in. Plus, I'm glad you enjoyed the post. Love ya!